It's not a still from the finished clip, (I had to adjust the depth a bit), but it's representative of what you will see. I designed the entire thing in Blender, which if you follow me at all on Facebook, you know as my 3D program of choice. 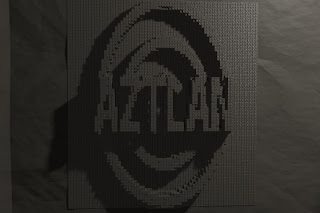 So, that covers Judgment Cove, Along in the Tub (both shown on my last post), and now AZTLAN. How are those coming along? Well, I told you that the Book Trailer was going to be mixed media, and the remaining two images will give you a hint as to what I have planned. The final two sections of the video will be shot live action, one with a "miniature" car, and the other with......well I'll leave that up to your imagination. Hopefully in the next few days I will have something else to show you, and in a week or two the finished trailer will be out, followed by a few videos on the making of.